Oh yes, this will make your day. More Simple Holiday Recipes that can whip up in minutes. We want to enjoy this holiday season, not add more stress. I’m sharing one of those decadent dessert short cuts that will make you a hero in not only in your own home, but with crowds of family and friends throughout the land. These kind of elegant looking cookies are sold in specialty shops, but with it comes a hefty price tag, so why not replicate the same White Chocolate Dipped Oreos at a fraction of the cost? Not only that, but they make such a unique hand made gift. There are so many variations that you can create from this same idea for different holidays – imagine candy corn during the fall, Red Hots or crushed Hearts for Valentines. Obviously, there are so many flavors of Oreos to choose from as well, but I went with the good ‘ole fashion ones I love. You can buy pre-crushed candy cane, but please don’t spend the extra money when you can get a little holiday stress frustration out by placing whole candy canes in a ziplock bag and going to town crushing them with a rolling pin. It’s therapeutic, I tell you. These are one of the Christmas short cuts that you definitely need to add to your list of new traditions. 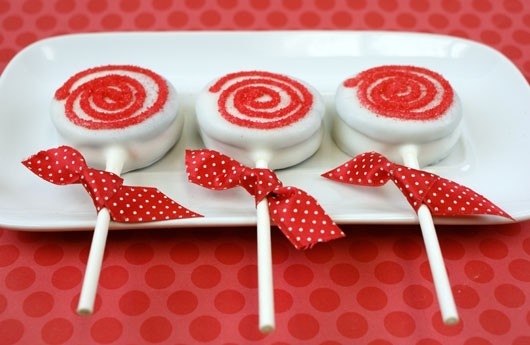 I love the idea of using the exact same directions as below, but placing the Oreos on suckers sticks first. 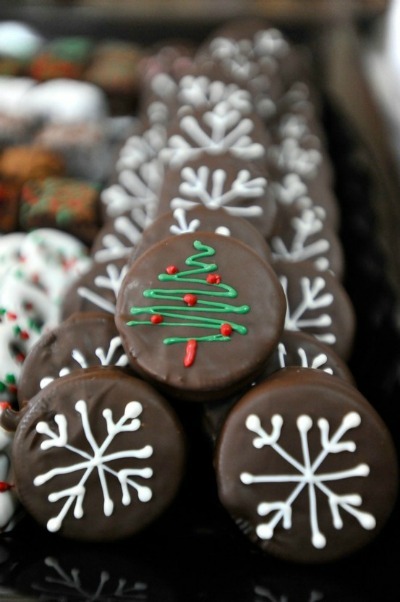 Or of course, chocolate covered Oreos with simple frosting decorations. Summary: This decadent dessert is the ultimate in short cut recipes. Every one loves White Chocolate Oreos. Place white chocolate in microwaveable bowl. Heat at 20 second intervals, stirring in between, until smooth. This may be done over the stove, as well. Dip the Oreo into the melted chocolate until coated. You may dip the cookie so that it’s coated on both sides or just dip in one side for variation. 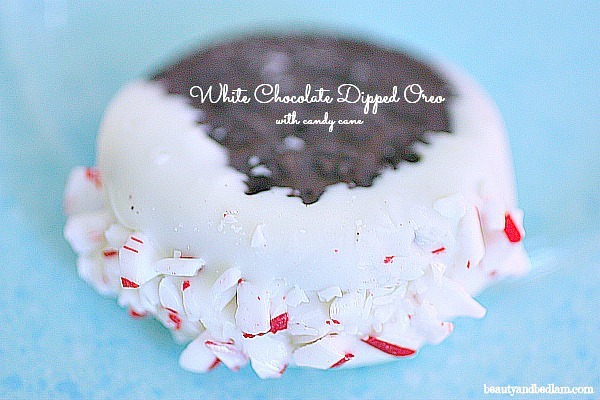 Place dipped Oreos on parchment paper. Before the white chocolate dries, sprinkle crushed cane onto the white chocolate area or dip one side for creative look. For more simple holiday recipes ideas, search here. You could use any flavors that you enjoy like milk chocolate.